The film which you are about to see is an account of the tragedy which befell a group of five youths, in particular Sally Hardesty and her invalid brother, Franklin. It is all the more tragic in that they were young. But, had they lived very, very long lives, they could not have expected nor would they have wished to see as much of the mad and macabre as they were to see that day. For them an idyllic summer afternoon drive became a nightmare. 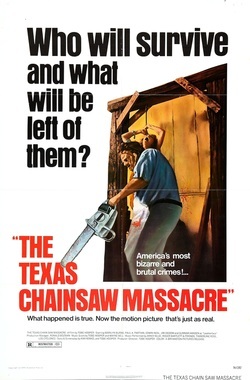 The events of that day were to lead to the discovery of one of the most bizarre crimes in the annals of American history, The Texas Chain Saw Massacre. In what I consider to be the best horror movie of all time, young Sally and her wheelchair bound brother Franklin, along with some friends, decide to visit the house of their grandfather after the occurance of some bizarre grave robberies in Texas. This goes horribly wrong when the group encounters a crazed, developmentally disabled man(who has come to be known as Leatherface) with a chainsaw(played by Gunnar Hansen). It appears he is wearing someone’s face as a mask. Sally soon finds out that Leatherface has a cannibalistic family who may be even crazier than he is. They catch her and torture her for the rest of the night. Director Tobe Hooper did a FANTASTIC job on this film. The major underlying theme of the film seems to be the state of the American family. The major questions it asks are “what kind of things would you do for your family?”, “What kind of impact does your family have on your life?”, “Can family mislead you?” ,“Do they take advantage of you?”. I think the ultimate question it asks is: “should you trust in stangers?”. This theme is especially apparent when Sally runs toward a house where she believes she will find help and ends up being tortured for the remainder of the night. Beyond the themes we can discuss the excellent use of camera shots in this film. From shaky camera movements to shots of Sally’s twitching, terrified eyes. The way the film is shot makes you feel completely uneasy. The setting of The Texas Chainsaw Massacre helps as well. The victims run through the dark rural area with little more than a flashlight and have absolutely nowhere to run to. The original Texas Chainsaw is chilling and horrific and should be highly regarded as one of the best slasher films of all time.